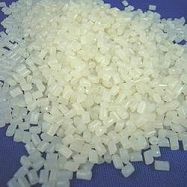 Nylon 6 or polycaprolactam is a polymer developed to reproduce the properties of nylon 6,6 without violating the patent on its production.It is a semi crystalline polyamide. Unlike most other nylons, nylon 6 is not a condensation polymer, but instead is formed by ring-opening polymerization; this makes it a special case in the comparison between condensation and addition polymers. Its competition with nylon 6,6 and the example it set have also shaped the economics of the synthetic fiber industry. highly resistant to abrasion and chemicals such as acids and alkalis. The fibres can absorb up to 2.4% of water, although this lowers tensile strength. The glass transition temperature of Nylon 6 is 47 °C. Material for power tools housings. Nylon 6 is used as thread in bristles for toothbrushes, surgical sutures, and strings for acoustic and classical musical instruments, including guitars, sitars, violins, violas, and cellos.